A little background: I've been playing FM Mobile for 5 years - the last time I had a personal computer (not a work computer) and had the full FM was '14. But I decided to gift myself with a new laptop and, in turn, FM19. I've been testing a few things for a week and am finally ready to start my full career. I've done many (many) career threads in other forums (OperationSports mostly) but this is my first one here. IRL I'm an enormous Spurs supporter from Upstate New York. I'm really doing this for my own purposes and if anyone enjoys it along the way, awesome. Cheers. [FM18] Unambitious Ambitions with Tottenham Hotspur F.C. A couple of things, for starters. I played FM on and off since the 2003 edition and a couple of weeks ago I returned to the game after a 5 years sabbatical. I played FM quite a bit in my day but throughout this time, my relationship with these forums ranged from non-existent to lurk-only. This is the first time I attempt anything like this, starting a career thread sounds like fun right now, but I could just as well just go missing randomly half-way through, so I offer my apologies in advance if that will be the case. Similarly, I'm not native to the UK, so even though I know my way around words, do expect a fair dose of ignorance to English footballing culture. Another thing, I play slowly, really really slowly. As I was learning the game I also took up Spurs and it took me over a month to complete a single season. I did eventually win the title and the FA cup, but I did do a fair bit of save/loading in the beginning as I was testing tactics and getting the hang of player interactions, transfers and contracts. And even though past October the results were all legit, my silverware felt fake and the save itself felt tainted - so I decided to delete it and start over, despite the youth intake gods granting me a 5 star newgen keeper that was described as "something something golden generation". This is not going to be a journeyman save through the lower leagues of the Maldives and my goal is as unspectacular as it gets - take up Spurs and build a Fergusonesque legacy. Develop a golden generation and then watch it hand over the baton to the next one. See as many academy products fulfill their potential and continue to have successful careers, even if it's at other clubs more fitting to their ability. Win trophies and firmly establish the club among the Real Madrids, Barcelonas and Bayern Munichs. The Game. Since I play at a snail's pace a couple of minutes of processing time won't make a difference. I know from previous FMs that the more leagues you have active the better the game ecosystem, so I loaded every league that's even remotely relevant. Plus, I reckon that loading not only the standout players in the lesser leagues but also the chaff makes scouting more challenging, which has always been a pet peeve of mine. The Manager. No particular meaning behind his name, I just went through the squads of two random teams and picked a random first name and a random last name. Then I googled the name of a borough in North London. You see, Mr Lucas Fuller has been a boyhood supporter of the club and academy graduate and while he did not make the cut for the first team, he went on to have a successful career as a center-back for various Championship and bottom Premiership clubs. He even got capped once, almost, but sadly had to withdraw from the squad due to an unfortunate testicular injury. But despite his respectable footballing past, his appointment as Spurs manager after the inexplicable resignation of Mauricio Pochettino still left everyone scratching their heads. He does possess the coaching qualifications and a semblance of a reputation, but surely he lacks what it takes to finally win this club some silverware. The Club. I do feel a bit like a fraud for 'replacing' Pochettino, in real life he's probably the among the managers least likely to lose their job, but I always had a soft spot for Spurs and what they represent - the underdog making it, and not through oil money but though good business decisions and competent management. So in that regard, the club is half way there, it has superb infrastructure, a good core of players to serve as a foundation, enough money to keep them and plenty of youth talent to develop. So here is where I bring the glory. Sounds simple enough. So, without further ado, I bring to you my Tottenham Hotspur career thread, complete with match by match updates, ruminations on tactics and youth development and the occasional rant. Welcome to the Tottenham Hotspur 2017 Team Thread First Team Squad Goalkeepers: Hugo Lloris - Club Captain and one of the best keepers in the game Michel Vorm - Probably not many better backup keepers than Vorm Pau Lopez - Young spaniard on loan from Espanyol for the 1st season, has decent potential Defenders: Kyle Walker - First choice Right Back in the squad and for England Kieran Tripper - Very capable backup Danny Rose - One of the best attacking left backs on the game to start with Ben Davies - Very capable backup, also able to play as a LCB should you decide to go with 3 at the back Jan Vertongen - Vice captain, has a good partnership with Toby Toby Alderweireld - One of the best defenders in the PL Kevin Wimmer - Decent backup, a little potential to grow stats wise Cameron Carter-Vickers - This kid has a lot of potential, give him as much game time as possible Midfielders: Victor Wanyama - One of the best Midfield destroyers in the PL Eric Dier - Young with potential to develop more, very versatile and can play a lot of different positions Mousa Dembele - Not many can knock this lad off the ball, ideal box-to-box player Moussa Sissoko - Decent rotation option to have in the squad Harry Winks - Youngster with some potential to develop into a good playmaker Christian Eriksen - The playmaker in the side Erik Lamela - Able to play out wide, centrally and can even be used as a false 9 if you wish, technically very good Dele Alli - One of the best Midfielders on the game, keep him at all costs Josh Onomah - Another youngster with decent potential, can be retrained to play outwide or can be a central playmaker Kevin Georges-Nkoudou - A raw talent who pocesses plenty of pace but not much end product unfortunately Forwards: Harry Kane - Homegrown World Class Striker, keep at all costs Son Heung-Min - Decent rotation option, is probably more iffective outwide as an inside forward however Vincent Janssen - Dutch backup striker with a little bit of potential but unfortunately doesn't develop into anything special Notable Youth: Marcus Edwards - Give him as many minutes as you can! Kyle Walker-Peters - Decent potential and can play both left and right full back Luke McGee - Young homegrown keeper, won't turn into your Number 1 but handy to keep for Squad registration Kaziah Sterling - Raw and Pacy, sometimes develops into a well rounded inside forward Tashan Oakley-Boothe - Young midfielder, sometimes develops into a decent squad rotation option Out on Loan: Federico Fazio - Sell! Nabil Bentaleb - You may wish to keep Nabil and develop him, he does have a bit of potential to develop, you can get north of £15m after his loan spell however. Clinton N'Jie - Sell! The Tottenham Way Formations In real life, if you have been following Tottenham closely, they mainly use a 4-2-3-1 system. They do however sometimes use a 3-4-2-1 formation. I have also used the 4-1-4-1 system before with this squad. Tottenham like to play a possession based game, with ball playing central defenders and also a sweeper keeper mopping up behind. The full backs will push on however Danny Rose gets forward just a fraction more than Kyle Walker at RB who tends to be a little more conservative. 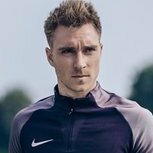 Whatever system Spurs play, you will see Eriksen acting as the chief playmaker, drifting around the pitch looking for space. Dele Alli will be close to Harry Kane trying to make runs off of him into channels. Transfer Market In recent times, Spurs have tended to look more towards young players aged 22 and under with potential to improve however the odd experienced Premier League player is signed (Wanyama, Sissoko in 2016. Trippier and Alderweireld in 2015, Vorm and Davies in 2014). Tottenham have also been trying to make best use of there Youth Academy and have seen a number of players graduate to First Team level in recent seasons (Jake Livermore, Steven Caulker, Ryan Mason, Tom Carroll, Bentaleb, Andros Townsend etc) Backroom Staff In real life, Paul Mitchell (Chief Scout in game) will be leaving Spurs in December 2017 so to keep things realistic you may wish to find a new replacement. The first problem you will need to address is there is no manager for the U18 squad (Nigel Gibbs was doing this IRL before moving to Swansea City, Kenny Jackett seems to be filling in currently). In real life John McDermott is very highly thought of at the club and oversees everything below First Team level at the club. Facilities the 2016/2017 season will be the last at White Hart Lane. NWHL is currently being built adjacent to the current stadium and will open in August 2018 with a capacity of just over 61,000. During the 1st season on the game you will play European matches at Wembley due to the building works at WHL. Wembley will also be the temporary home used by Spurs for all domestic games in the 2017/2018 season. The clubs training ground is called Hotspur Way and is rated as being one of the best facilities of its kind in Europe. Youth Recruitment is well established and the Youth Coaching is very good. Finances Due to the new stadium build, there is a big bank loan to pay off (north of 600m). In my experiences the loan doesn't have a huge burden on the finances aslong as you are successful and savvy with your transfer dealings. At the start of the game you are able to get £50m to spend and nearly 300k in spare wages. Invest wisely!